I purchased a little piece of leather suede from Colorado Fabrics a few years ago with the intention of trying to make something out of it someday. That day finally came with Jamie’s challenge! I decided to try two things: general sewing and machine embroidery with suede. Machine Embroidery My friend Deborah Jones is an expert in machine embroidery. She has written several books, is a regular columnist in Designs in Machine Embroidery magazine, has several classes on Craftsy, and contributes in countless other ways to the industry. For my project, I used her book “Machine Embroidery on Difficult Materials”. According to the book, I was working with a 2-ounce split suede. Given that I had a pretty small piece, I decided to try and make an embroidered pouch. From advice given in the book and from ColDesi, I knew that I needed to use a design with not too many dense stitches. Either I could chose a “light” design like a redwork design or I could choose a more dense design with the intention of scaling it up by 10-15%. I chose two designs from Urban Threads, one a redwork design that I really like and one traditional design. Using Deborah’s instructions, I used a hydro-stick stabilizer and a ball-point needle (size 80). Once you punch a hole in leather, it’s there forever! So I stitched out both designs on muslin with a few layers of No Show Mesh Fusible stabilizer first (using a size 75 embroidery needle). They stitched out beautifully so I moved on to the suede. I did test stitch outs on some small “arms” of the suede. Technically, I had no problems stitching either design on suede. The hydro-stick stabilizer really works nicely to keep the suede from shifting around and stretching. But the embroidery threads in the redwork design seemed to sink into the suede and almost disappear. It looked great on muslin, but was not as eye-catching on the suede. So I decided to use the Rabble Robots on my final product. Sewing I made a pouch using instructions found here. 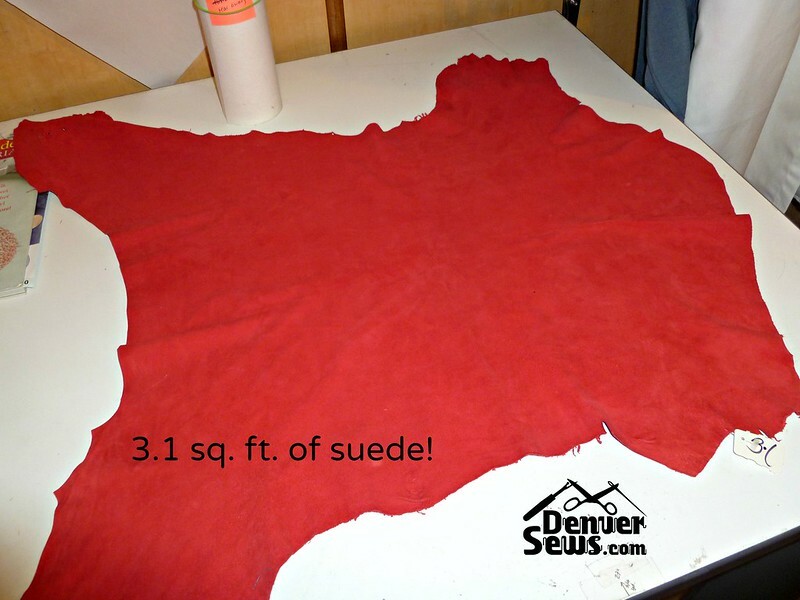 The difficult part was the actual sewing of the suede. I used a teflon foot. But 2-ounce suede is pretty stretchy and I think I used the wrong type of needle. I used a universal size 75 needle. Perhaps a ball point needle or a leather needle might have been better. The suede also wouldn’t travel under the teflon presser foot very easily and would get stuck. It was frustrating! For the final pouch, I added Pellon Thermolan Plus Fusible stabilizer to the lining hoping to give the pouch some body, but the suede still feels floppy as it is not as fully stabilized as the lining. Despite its shortcomings, I love this little pouch – the suede is incredibly soft and the Rabble Robots are really cute. 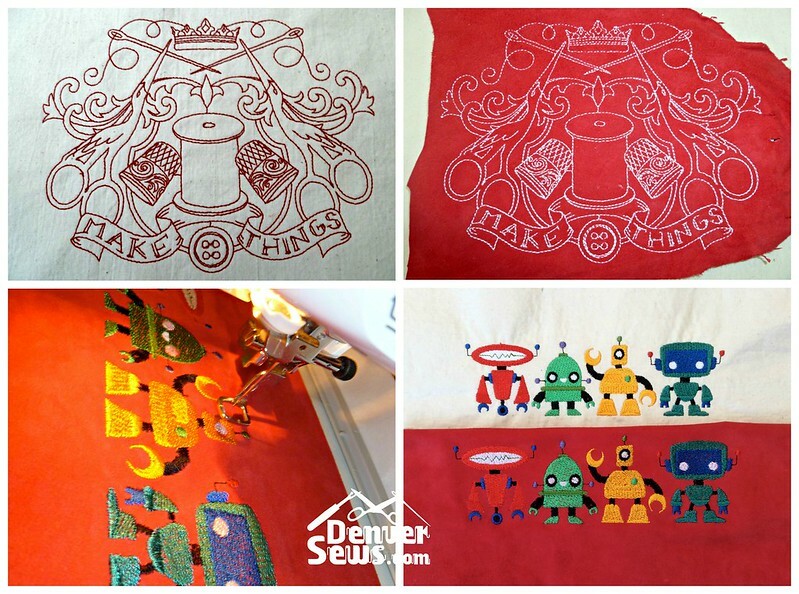 For the lining, I used robot quilting fabric that I used 15+ years ago to make camping pillows for my kids. From this little experiment, I would say that machine embroidery on 2-ounce split suede is quite doable – use a ball point needle, hydro-stick stabilizer and be sure to scale up your design by 10-15% to spread out those stitches. Deborah Jones’ book is an excellent reference for machine embroidery on leather. As for sewing, I am a little less sure. I think the suede is a little too floppy and needs some kind of stabilization. I also had a great deal of trouble just sewing through the suede and getting it to feed nicely on the machine. Anyone have any experience with this? I’d love to hear. I’ve sewed lambskin and had no problems feeding it with a teflon foot, but I’m sure a straight stitch is very different than embroidery. Before I got a teflon foot I did one project with bankers tape (is that what you call the paper you put in a calculator?) between the leather and the foot and that worked well too. That is too cute! I love the red leather and the design. I’ve been wanting to sew on leather. Is there nothing you can’t embroider? 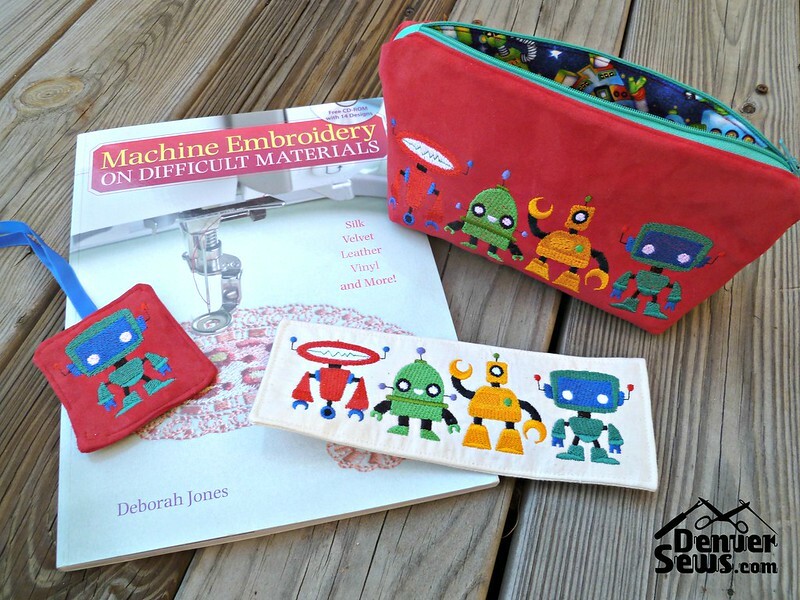 This is a fantastic and fun design – I love the colorful robots! You always manage to accomplish what I assume is impossible. I had no idea suede could be embroidered! I love the sewing theme of the first design too. Do you think the stitching on that design would have popped more on the red suede if you had embroidered it with black instead of white thread? I suspect that the black thread would have sunk into the suede just as much as the white. The whole thing just looked a little too thin. Those robots worked a lot better.